Surprise!! Before you get all excited that we’re halfway through the week and that So You Think You Can Dance is on tonight (go, Melanie! ), I’m sorry to tell you that it is Tuesday and that we’re just so excited to be home and back in our kitchens that we have a couple of extra recipes this week. As I mentioned in yesterday’s post, a few weeks ago, I had Wendy’s Berry Chicken Salad for the first time and I loved it. I also realized that it was hardly rocket science and that putting my own version together couldn’t be too tricky, right? So much to my husband’s dismay that I wasn’t re-creating the Baconator (also known as the Widow Maker), I tossed together some fresh greens, strawberries, blueberries, toasted almonds, feta cheese, and this Berry Vinaigrette. It ended up being the perfect summer dinner after a long day of working in the yard. He didn’t complain too much, although I’m pretty sure he quietly poured himself a bowl of cereal a few hours later. First, I marinated some chicken breasts in some light Italian dressing and then grilled them up on the back patio. While they were cooking, I tossed some sliced almonds into a non-stick pan and toasted them over medium heat, stirring frequently, until they were light brown and fragrant. I rinsed the strawberries and blueberries and sliced the strawberries. and added a handful of blueberries, some crumbled Feta cheese, and the toasted almonds. If you’ve had the Wendy’s salad, you might be thinking, “Stupid Kate, that’s Parmesan, not feta in the Wendy’s salad.” Surprisingly, I do know my cheeses, I just prefer Feta in this salad. But freshly shaved Parmesan is also super delicious here, so use whatever you prefer. Anyway. 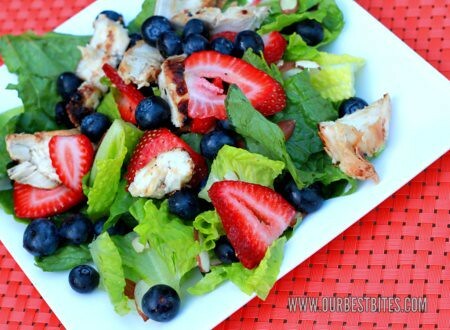 I topped the blueberries with the strawberries and then after the chicken was done, I let it stand for a few minutes and then I sliced it up and added it to the salad. I served the dressing on the side, but if you’re making this all in a big bowl for a crowd and are serving it immediately, I’d recommend dressing the entire salad just to make things easier. *For a vegetarian dish, omit the chicken. Looks great- LOVE the colors! Oooooh, this looks delicious! I’m pretty sure you could change up the combination of cheeses, nuts or berries in this and it would still be gorgeous. Now all I need is some summer weather to enjoy this in and I’m set! Delicious! This is what we’re having for dinner tonight. My hubby will think it’s fancy since there is feta cheese and almonds. It will totally appeal to his food snobbery! Wow, that looks fabulous! I recently had that salad at Wendy’s and really enjoyed it. I’d love to be able to make it at home. 🙂 And I just got home from picking strawberries! 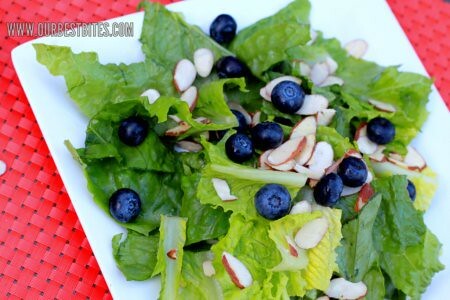 love that salad…one of my favorites. Oh yum! I’m always struggling for quick summer meals and this looks perfect!! It looks wonderful! I’m not sure I could convince my hubby though. He usually thinks I’m putting too much on salads when I add extra veggies or cheese. I haven’t tried the Wendy’s salad, but am thinking I might have too soon. Yum! This looks very similar to a salad I just tried and plan on making tonight. Same idea, but with pecans, no cheese and some pineapple and mandarins thrown in. Perfect for the 4th of July! Can’t wait to try it! Thanks for the ideas and recipes. Strawberry and feta salad is probably my all time favorite! We throw a little diced red onion in ours as well and the flavor combination is surprisingly really good. How beautiful everything looks mixed together! Yummy! Can’t wait to make that dressing it sounds delish! Thanks for the summer ideas I am always in need! I love berry salads. Unfortunately my husband does not so I don’t get to make them that often. I heart the cupcake activist! We made this for dinner last night. I could tell my husband was not excited about this concoction, but he was trying to be polite and not say anything about his skepticism. He ate it anyway and LOVED it! He said several times during the meal how much he liked it and said at the end…”This could be a restaurant meal.” It might have been the best compliment he’s ever given me. He really liked it. Thanks for all your great recipes…They’re all so yummy. You’ve made cooking fun for me. Can’t wait to try the Fruit Pizza. might make it New York Style with a thin crust. Oh looks so yummy. 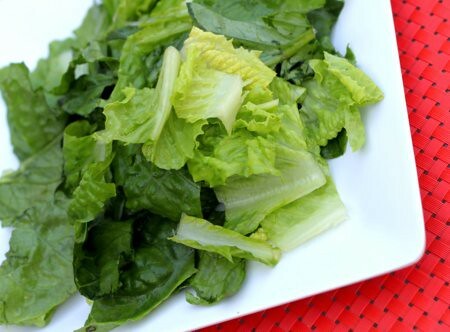 I’m always trying to find new salad ideas– we have been getting two heads of lettuce every week in our produce box lately. That’s a lot since my toddlers tend to be suspicious of salads. I bet they’d like this though. 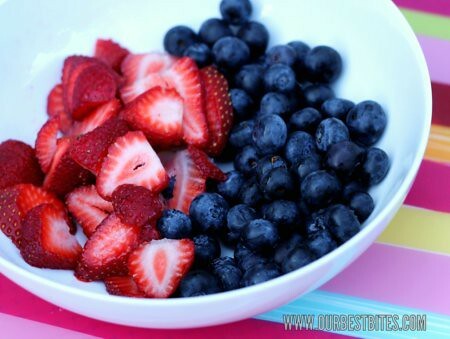 Who doesn’t like berries, right? Love it! I’m pretty sure my husband has a bowl of cereal or cookies and milk most nights no matter what I’ve made for dinner–burnt or perfect! I don’t really like Melanie. Probably because she’s the obvious Judge Favorite. I was pulling for Nick, the tap dancer, but now that he’s gone, I will have to find a new favorite, I guess. Oh, I loved Nick!!! I was so sad he got the boot. He was my favorite after Melanie. You totally got me- I saw your post and immediately thought- “Oh good, it’s Wednesday!” Then it sunk in. Nope, it’s just Tuesday. But yay for the extra post! Thanks 🙂 It’s time to make a new menu and this salad is on the top of the list. I can hardly wait to try it. I love that salad too. In fact, we are moving cross country (I was the one from the book signing leaving Ohio and going to Idaho) and I have already decided that is what I am eating for every meal. Hopefully keeping my traveler’s fanny to a minimum. OH MY GOSH, I know, right?!?! That and the Greek pita and my life would be complete. This sounds delicious! We are always looking for a good new dinner salad. I’m thinking it would be even easier if I used half a rotisserie chicken. And I’m going to try it with queso fresco instead of feta because that’s what I have in my fridge and I think it will be nice with the berries. Thanks for the bonus post! I love dinner salads! Especially in summer. Thanks for sharing. That is exactly what I did after eating that salad from Wendy’s! I thought it tasted great, but there just wasn’t enough for the price — so I made my own. I am SO excited to try your dressing, though, I just used some raspberry vinaigrette I had on hand, which was okay. But homemade dressing is definitely superior! OMG! Made this tonight and it was soooo good! Actually, it was extremely good! I left the blueberries and feta out cuz I forgot to buy some today and I used splenda instead of honey in the dressing. I can’t wait to make this for my dinner guests next week! Amazing salad! It was so good!! 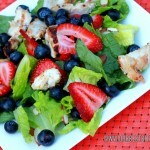 My husband didn’t think he would like the berry dressing but he loved it to. The salad looks delicious! Man, fresh fruit sounds so good right now. Oh, and Melanie is my favorite on SYTYCD too! They are all incredible dancers, but she is most definitely my favorite! So delicious!! Thank you for sharing!! I made this more my Mother in Law and I and we both loved it. The dressing is SO good. 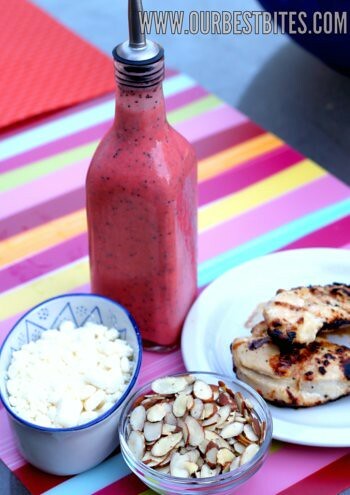 This is a perfect Summer meal! This is my all time favorite salad! Me and hubby made it like 4 or 5 times within the first week of me finding this recipe. So fresh and delicious! This is a great salad for Wendys. I’ll have to try this recipe! This dressing looks so yummy! I’m excited to try it. I live in Utah and I love the balsamic vinaigrette at Porcupine Grill. Do you have recipe for a balsamic vinaigrette? Yep- it’s in our new cook book that comes out next month!